the new glass architecture of the parliamentary precinct. 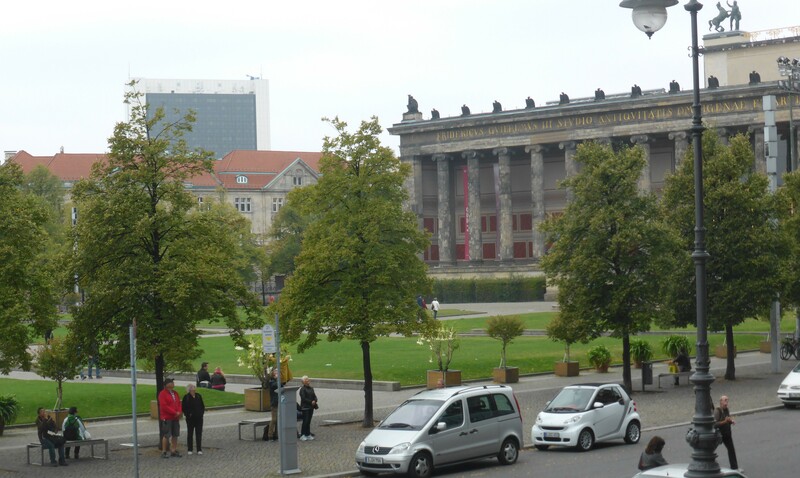 Altes Museum, one of the many neo Classical buildings designed by KF Schinkler, used to be draped in Nazi flags when Hitler spoke to the crowds in the Lustgarten from here. 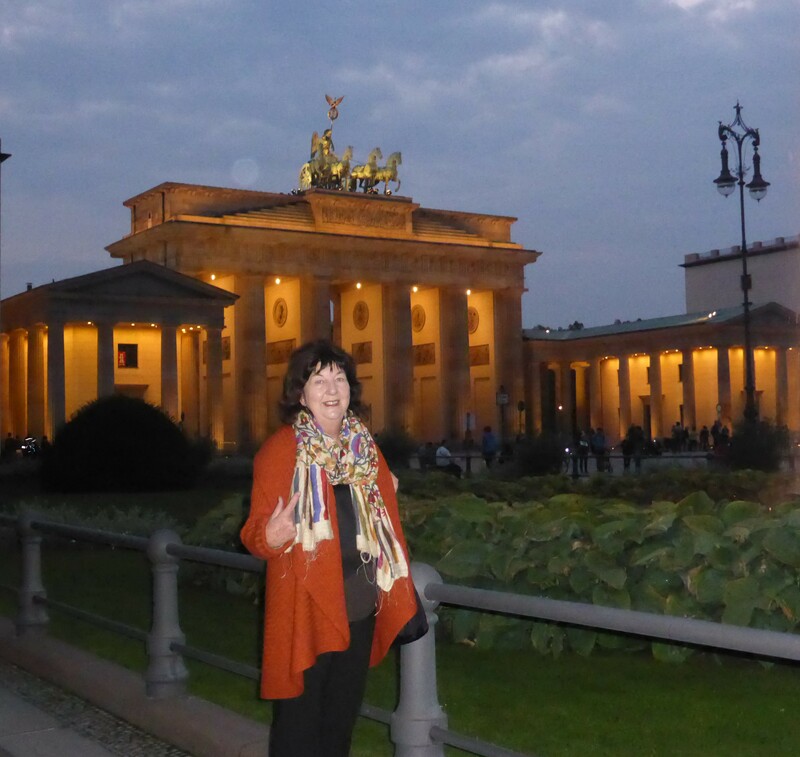 How could you go to Berlin and not have your photo taken at twilight by the Brandenburg Gate? 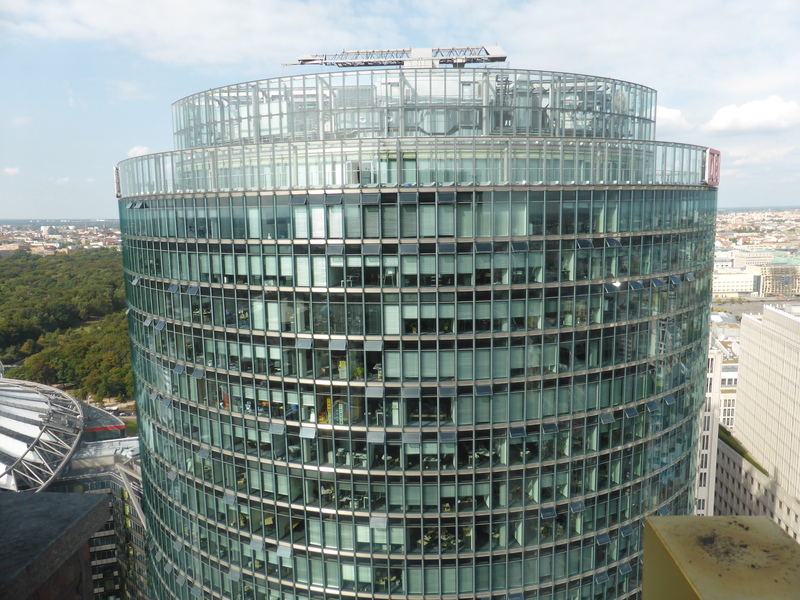 The city surface is like a marbled cake – here some Prussian grandeur, there some remnant communist building not the least of which is their showpiece TV Tower on Alexanderplatz, over there a monument to the murdered Jews of the holocaust and finally some standout modern architecture. 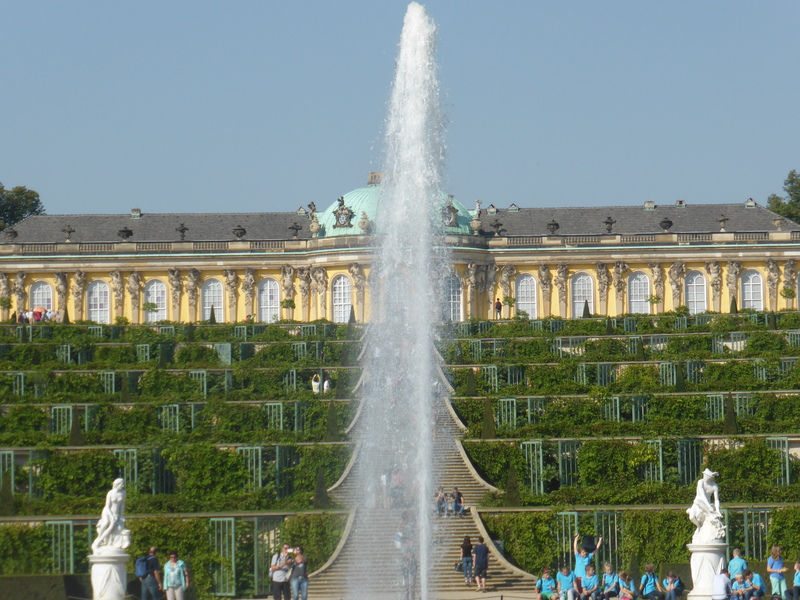 And most of it , including the restoration of the Prussian palaces, built in the last 70 years since 70% of the city was bombed. 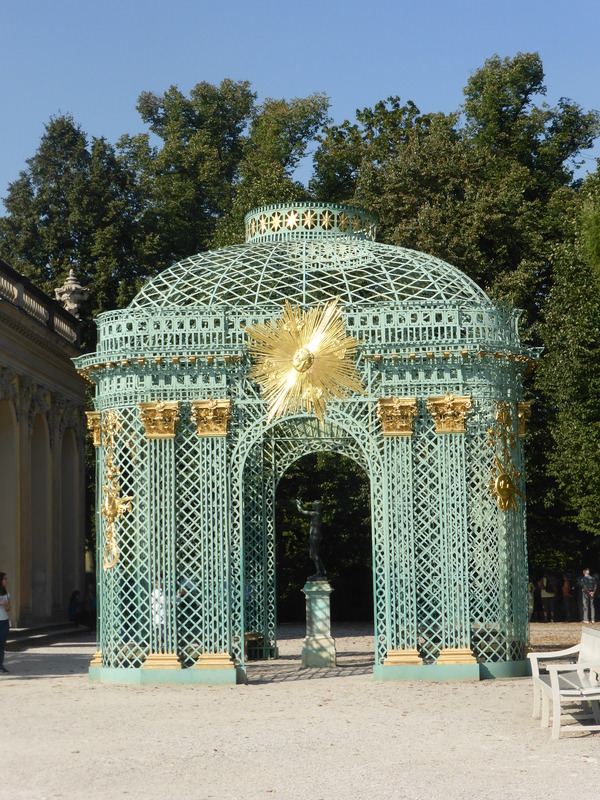 Scattered throughout are the dozens of museum and galleries to every aspect of past and present life. 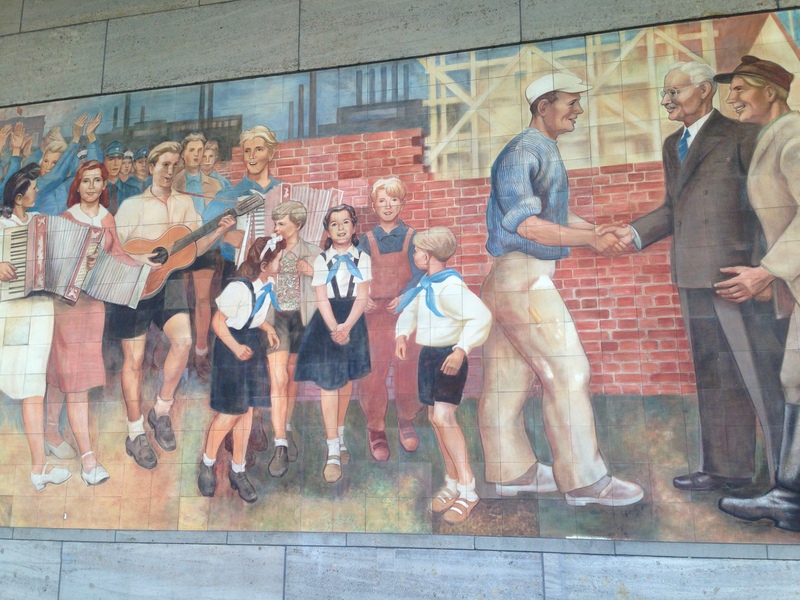 Part of a large communist era mural adorning the old Luftwaffe building. Part of the Sony Centre at Potsdamer Platz. The Wall ran right through here and destruction was rife; it left a blank canvas for some great modern architecture and a wonderful arts precinct. This is a city central to World War 2, the epicentre of the Cold War and now capital of a country leading much of the world in free education, renewable energy and support to other nations. The city in its many museums and memorials resonates with thousands of showcased stories (often retold on large cardboard placards) about both the perpetrators and the victims of its history. This is reconciliation on a large public scale. 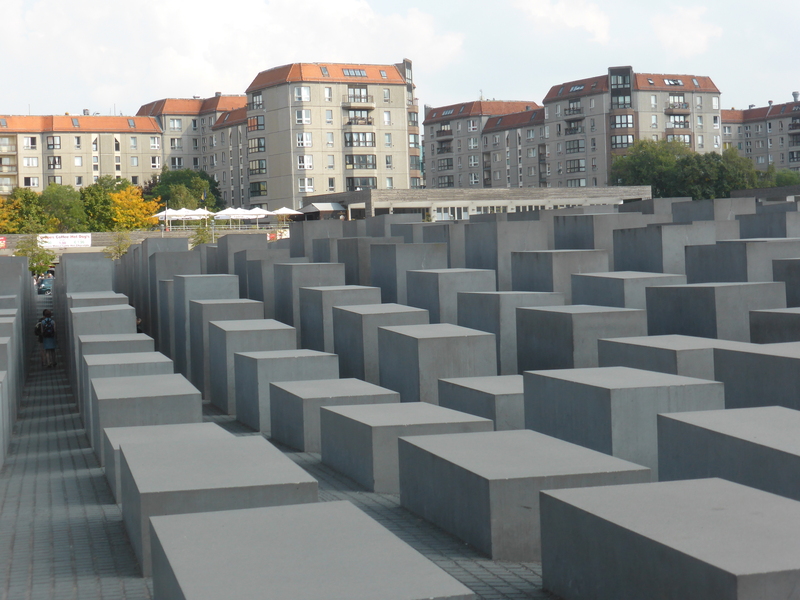 Here taking up a city block are the labyrinth Field of Stelae or the Holocaust Memorial. Underneath in one room short biographies of the 6 million Jewish people killed in Hitler’s war are read out. To read them all takes 7 years. 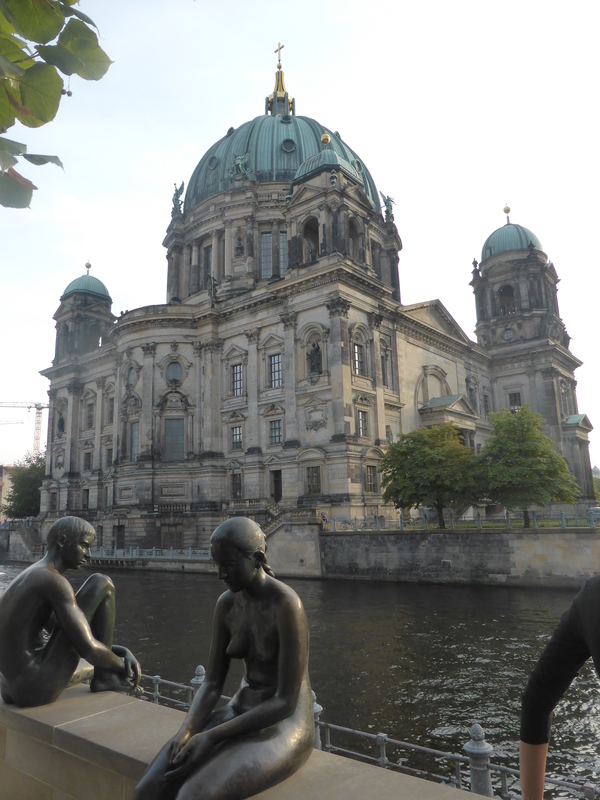 One small reason I came to Berlin was my own struggle to understand “man’s inhumanity”. On a much smaller scale in my own country the majority of people are seemingly unmoved by the government’s treatment of asylum seekers, and the awful life suffered by many Aboriginal people passes mostly unremarked. 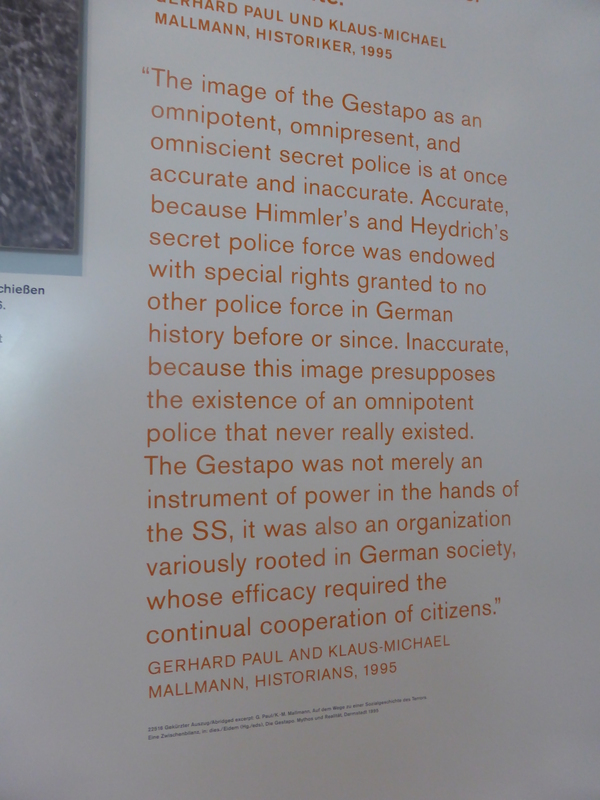 I came to touch the surface of how the German people, who remind me much of Australians, seemed to be compliant during the years from 1933, ignore the persecution of the enemies of the Reich, the unbridled fascism and later the unbridled power of the Stasi. In many memorial museums stark cardboard placards record history, mostly in the form of individual stories. They used to say New York was where the future came to rehearse. I think Berlin is where the future is being created, where everything old is new again and much that is old is actually new and there is striving to do it well.